Some of you have been asking about the May 4th 2010 announcement by GlaxoSmithKline that they were suspending a clinical trial of their resveratrol drug because of safety concerns. Some of the articles went so far to say that people should be cautious about taking resveratrol supplements until these safety issues had been resolved. Let me make this perfectly clear! The "resveratrol" drug referred to in these articles is not resveratrol itself! Please read the following information regarding resveratrol from Stephen Chaney, PhD. effective compound out of those 500,000 that they screened at turning on the anti-aging genes. That was great news for those of you who are using resveratrol supplements, but it was bad news for them because they couldn't patent it and, therefore, couldn't sell it to a drug company. But all was not lost. There is a time-tested process for dealing with this dilemma. You just make a chemically modified derivative of the natural compound and, if it works, you patent the chemical derivative and sell it to a drug company. So that's what the scientists at Harvard did. 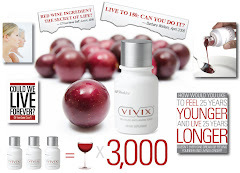 They made a chemical derivative of resveratrol called SRT501, showed that it also turned on the anti-aging genes, patented it and sold it to Sirtris Pharmaceuticals for $500 million. Sirtris, in turn, sold it to GlaxoSmithKline for $720 million. This is a frequently used process. Many successful drugs have been obtained this way, but the process is also fraught with perils. displayed unexpected toxicity that caused GlaxoSmithKline to halt clinical trials of the drug. But, SRT501 is not resveratrol and the toxicities of this drug have nothing to do with resveratrol. Resveratrol is a completely natural nutrient found in grapes, red wine and other foods. SRT501 is a man-made chemical derivative of resveratrol. Again...for the natural, safe and effective anti-aging resveratrol supplement you can rely on Shaklee the leader in natural products.